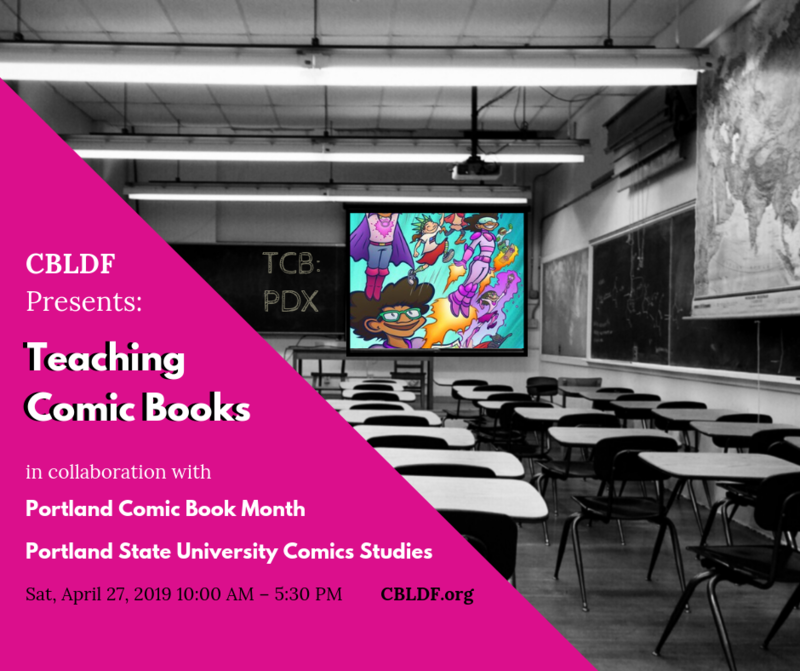 Comic Book Legal Defense Fund is proud to present Teaching Comic Books, a one day conference created in collaboration with Portland State University Comics Studies and Portland Comic Book Month. 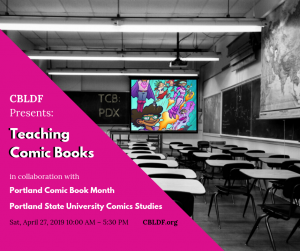 TCB:PDX gathers leading expert educators, librarians, advocates, and creators for an intensive one-day conference about the values, challenges, and benefits of teaching with comics. Space is limited to 50 participants on a donation basis, so reserve your space now! Every participant will receive a gift bag of education handbooks, comics, and other resources from CBLDF, enjoy light snacks and refreshments during breaks, and be entered into a raffle to win a classroom graphic novel library courtesy of our sponsors. Register here for Teaching Comic Books, and check out the schedule for the day below. Make sure you stay posted to CBLDF.org for updates about the conference. After being told as a kid that comics were only for boys, Susan E. Kirtley grabbed a copy of the X-Men and was hooked. “For boys only? Are you kidding? The X-Men had all the drama of Days of Our Lives, but with cooler outfits and more punching. As I began to read the exploits of Cyclops and the team I realized these were kindred spirits,” Kirtley explains. Not only were comics entertaining, they offered empowering possibilities in feminist rhetoric. Kirtley, who oversees the Comics Studies certificate at Portland State, opens TCB: PDX with a passionate keynote about the power of teaching comics. How can teachers and librarians help young audiences come to terms with difficult topics and complex concepts? This program provides suggestions for comics that address the tough topics affecting young people, including discrimination, bullying, racism, and disability, while also presenting fresh ideas for using comics to teach social justice, identity, and freedom of expression. Share success stories with other teachers and librarians, and learn ways in which comics are a powerful tool for helping young people understand the more difficult parts of growing up. Enjoy Portland’s incredible food culture when you pair up with new friends and colleagues for an off-site lunch break! Even though comics are an increasingly popular format, their benefits are still misunderstood by many administrators and decision-makers. Learn about breaking through various barriers to the use of comics in classrooms and libraries, from enduring stigmas about the pedagogical validity of the medium, to challenges to the visual components of the medium, to financial challenges associated with developing and curating a comics collection. This program offers practical advice about the value of comics in educational settings including their use in subject areas such as science and mathematics. Learn and share strategies and resources to overcome barriers to using this incredible medium. Connect with fellow attendees and speakers over coffee and snacks! A panel of local comics creators will discuss the process of making comics and how they combine writing, art, and hours of research on every comics page to create a sum greater than the parts. Whether made by a single creator or in collaboration with several people, the processes that bring comics to life draw on a wide range of skills, which means students have a variety of entry points for accessing the medium’s powerful lessons. This discussion will define the basics of comics storytelling and provide a practical perspective on how to deepen the medium’s place in your classroom or library collection. 5:00 – 5:30 – TCB Talkback! Share your takeaways from the conference, ask any questions you weren’t able to explore during the day, and help us set a course to create even more tools to help keep you Teaching Comic Books all year long. TCB: PDX is organized by the Comic Book Legal Defense Fund in coordination with Portland State University Comics Studies and Portland Comic Book Month.